HP Aims to Simplify Unified Communications Deployment | One Stop I.T. HP today announced two new offerings that aid in the rapid adoption of unified communications (UC) solutions from Microsoft and Polycom. The new offerings include HP AppSystem for Microsoft Lync, a turnkey platform designed to expedite Lync deployments, and a customizable HP and Polycom Rich Media Communications (RMC) solution for video and collaboration. Although many organizations are deploying Microsoft Lync, not everyone is embracing it. One reason is that internal staff lacks expertise or can dedicate time to deploy UC. Another issue is it is too complex to integrate into existing systems. Further, the IT staff may even be unsure is their current network will support UC reliably. Other issues include needing to connect to legacy PBXs, scalability, need to deploy in virtualized environment, and wanting to integrate high-end telepresence systems. Thus, many corporations stick with what they have or play the waiting game, looking for a provider that offers a soup-to-nuts solution and will back it up if things break. HP is one such company with big-name recognition that will have a corporation’s back should something go wrong with the UC platform via their just launched HP AppSystem offering. HP AppSystem for Microsoft Lync is a pre-integrated platform for Lync deployment. The platform bundles hardware, support, and consulting services. You can think of it as UC-in-a-box or Lync-in-a-box, which is easier than if you had to perform the assessment, racking, and deployment yourself. 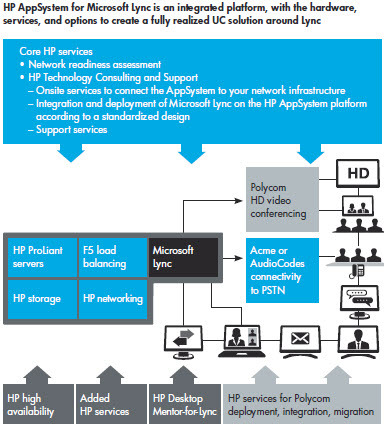 HP AppSystem for Microsoft Lync is built on HP Converged Infrastructure. The solution is pre-configured for rapid deployment of Microsoft Lync and includes assessment, deployment and support services, making it easier for companies without an IT infrastructure to deploy UC. Further, HP is enabling clients to quickly and cost-effectively deploy Polycom RealPresence video solutions, which not only works with Microsoft Lync, but also Cisco TelePresence (CTS) systems – through support for Telepresence Interoperability Protocol (TIP). This allows corporations to use low-end webcams on employee’s desktops all the way up to room-based telepresence solutions from PolyCom or Cisco. – Achieve enhanced collaboration with the Polycom RealPresence video solutions and Polycom RealPresence Collaboration Server to provide presence-based virtual meeting rooms. – Reduce costs with comprehensive Public Switched Telephone Network connectivity options through state-of-the-art SIP Trunks via Acme Packet Session Border Controllers that allows external communication via IP, eliminating the need for costly Basic Rate Interfaces and Primary Rate Interfaces. Also available is an AudioCodes Mediant gateway providing Time-Division Multiplexing connectivity with a client’s existing legacy infrastructure. The HP and Polycom RMC solution combines HP Networking products based on the HP FlexNetwork architecture with Polycom RealPresence video solutions built on the Polycom RealPresence Platform, which provides comprehensive software infrastructure for universal video collaboration. Clients can easily prepare and install network video capabilities from desktop to conference room and immersive suites. HP and Polycom RMC is an open standards based, interoperable and extensible offering that enables easy integration into an organization’s existing multivendor environment. In addition, it has built-in multilayer security to protect users’ video streams and applications. — HP AppSystem for Microsoft Lync will be available in select countries in May. — The HP and Polycom Rich Media Communications solution is available worldwide through HP Technology Services and HP and Polycom channel partners. — HP integration, deployment and support services are available globally.